Hoheria is a genus belonging to the tribe Malveae and the subfamily Malvoideae of the angiosperm family Malvaceae. The 3-6 recognised species of Hoheria are endemic to New Zealand (and the Kermadec Islands). The generic name is a Latinisation of the Maori name, houhere, which competes for use as an English vernacular name with lacebark and ribbonwood. Hoherias are large shrubs or small trees, bearing large quantities of 5-petalled, white, flowers in summer or autumn, and are therefore useful as horticultural subjects in a suitable context. The genus was introduced by A. Cunningham in 1839, with Hoheria populnea as the type species. Hoheria is closely related to Plagianthus (also a New Zealand endemic genus) and also Asterotrichion (a Tasmanian endemic genus) and Lawrencia and Gynatrix (Australian endemic genera). These genera belong to the tribe Malveae, where they are the sister group to the remainder of subtribe Abutilinae.. There are 3-6 species, divided into 3 groups: the Lacebarks, Hoheria populnea A. Cunn., Hoheria sexstylosa Colenso and Hoheria equitum M. Heads; the Narrow-leaved Lacebark, Hoheria angustifolia Raoul; and the Mountain Lacebarks or Ribbonwoods, Hoheria glabrata Spring and Summerhayes and Hoheria lyalli Hook. f. The first two groups both have winged fruits, a characteristic which distinguishes them from the last group (section Apterocarpa), in which the wings are rudimentary or absent. H. sexstylosa is sometimes reduced to varietal rank within Hoheria populnea, and Hoheria glabrata within Hoheria lyalli; Hoheria equitum is a newly described  species related to Hoheria populnea. Hoheria ovata Simpson and Thompson was reduced to varietal rank within Hoheria sexstylosa by Allan. It is found in a restricted area of South Island, and has foliage closer to that of Hoheria populnea than that of typical Hoheria sexstylosa. Various hybrids occur, including sexstylosa × angustifolia and glabrata × lyallii. H. populnea var. lanceolata (and perhaps also H. lanceolata hort.) represents the former cross. IPNI lists a Hoheria ×sexangusta Allan, which one assumes is also the hybrid sexstylosa × angustifolia. A specimen of angustifolia x glabrata is present in Rock Mill Arboretum, Warwickshire, UK. There are also Hoheria allanii Cockayne from the Canterbury Plains, and Hoheria dentata var angustifolia from the Southland Plain. No further details have been found about these plants, and the names are assumed to be invalid. The 3 species Hoheria populnea, Hoheria sexstylosa and Hoheria equitum form a closely related group of species with mostly non-overlapping ranges. (There may be a zone of overlap between the distrubutions of the first two.) The Lacebark, Hoheria populnea, is found in the north and west of North Island, on Three Kings Isles (northwest of the mainland), on Great Barrier Island, and on the Kermadec Is. (not shown) far to the north-east. The Long-leaved Lacebark, Hoheria sexstylosa, is found in a belt across North Island south of the range of Hoheria populnea, and in the west of South Island. The Poor Knights Lacebark, Hoheria equitum, is found on the Poor Knights Islands and Hens and Chickens Islands, lying to the east of Northland. Hoheria “Tararua”, or the Cook Straits Lacebark, may be a fourth species, not yet formerly described. A floriferous branched shrub or small tree, growing to up to 11m in height, from the North Island from sea level to 1500ft asl. Early growth is rapid, and while the plant prefers good soils, it is tolerant of poorer sites. The 2cm across white, scented, flowers are borne in cymose clusters of 5-10 flowers in late summer and autumn. The flowers have 5, or rarely 6, styles. The calyx is campanulate, with triangularly toothed sepals. The foliage consists of narrowly oval, glossy, dark-green, toothed, evergreen, leaves, from 2" to 5" in length. Each flower gives rise to 5, or rarely 6, seed pods, which are broadly winged. The bark was used by the early Maori, and also the early European settlers, as a source of fibre, particularly for use as cordage. The timber is used for furniture making. There are no known synonyms of Hoheria populnea. Synonyms: Hoheria sinclairii Hook. f. is a synonym of Hoheria populnea. Hoheria sexstylosa is a spreading small tree or shrub to 8m in height and 6m in spread. It has steeply ascending stems and branches. The smaller branches become drooping or even pendulous as the tree matures. It has deeply incised, serrated evergreen leaves and scented, star-shaped, white flowers, up to 2.5cm (1") across, displayed in 2-5 flowered cymes in leaf axils in late summer and autumn. The flowers have 6 or 7 pinkish styles. It is usually multi-stemmed. The foliage is very variable on young plants, being ovate or rounded, 2.5-7cm (1"-3") long, and variously lobed or toothed. Adult leaves are alternate, lanceolate, 3-15 cm long, 2-5 cm wide, acuminate, glabrous, dentate, light glossy green above and paler beneath, with a 'weeping' habit. The calyx is pubescent, and the leaves sometimes bear hairs in the axils of their teeth. The fruit is similar to that of H. populnea. The wings are white or purple in colour. The bark of H. sexstylosa, like that of H. populnea, has been used as a source of fibre. The tough white timber is used in cabinet-making, and as firewood. The pollen is 4- to 5-porate, stephanoporate, subspheroidal and echinate. H. sexstylosa var ovata is a localised form from South Island (Nelson and northern Westland), with adult foliage similar to (ovate to broadly ovate), but smaller (2-3" long), than that ofH. populnea. Its flowers have 5-8 styles. There are no known synonyms of Hoheria sexstylosa. Synonyms: Synonyms of Hoheria sexstylosainclude Hoheria populnea A. Cunn. var crataegifolia Hook. f. and Hoheria sinclairii Hook. f. Hoheria ovata is a synonym of Hoheria sexstylosa var ovata (Simpson & Thompson) Allan. A hybrid of Hoheria sexstylosa and Hoheria angustifolia, this plant is distinguished by the presence of acuminate calyx lobes. Synonyms: Synonyms of Hoheria ×lanceolata are Hoheria populnea var. lanceolata Hook. f., and Hoheria lanceolata hort. Hoheria equitum is a newly described  species from the Poor Knights Islands and Hen and Chickens Islands off the east coast of Northland, New Zealand. It differs from H. populnea in its smaller, glabrescent flowers, and broadly elliptic leaves with recurved margins which are entire or only shallowly serrulate. It is an evergreen tree reaching 6 m in height. It is more or less glabrous except that the young shoots and calyces bear stellate hairs. The yellow-green adult leaves are borne alternately. They are elliptic to broadly elliptic, with the apex obtuse to subacuminate (the acumen, when present, is often obtuse), ranging in size for 7×3 cm to 15×9.5 cm, and are borne on a petiole around 2.5 cm long. The edges of the leaf are recurved (bent backwards), and either lack serrations, or bear blunt teeth about 1 mm long. The caducous stipules are linear, and about 3.5×0.5 mm in size. Hoheria equitum flowers in mid to late summer. The flowers are borne in clusters of 1 to 3, or rarely up to 15, flowers in the leaf axils. The clusters are fasciculate, i.e. each flower is borne on a single stalk, which is articulate, and which probably corresponds to the combination of a peduncle (cluster stalk) and pedicel (flower stalk). The flowers are about 1 cm across, rarely twice of more this size. The calyx is rather deeply toothed. The petals are white, somewhat assymetrical with a notch to one side of the apex, with an obtuse apex, and a slighty clawed base, and are adnate to the staminal column, which bears around 20 stamens in 5 bundles. 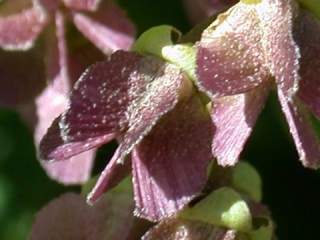 The anthers are dark red, fading to a pale yellow. The style has 5 branches, with 0.5 mm wide capitate or obliquely capitate stigmas. Lacebarks are in cultivation in New Zealand, Australia, Great Britain and the Pacific North West. There are too large for general use as a greenhouse plant (or in a small garden). They require a mild, damp, climate, and in Great Britain benefit from being planted in front of a south-facing wall. They are tolerant of most soils, but may not succeed on a heavy clay. As might be expected from their respective ranges H. sexstylosa is hardier (zone 8) that H. populnea (zone 9). The former is described as being hardy to -15°C. Propagation may be by seed, cuttings, or layering. Seed should be sown under glass in the autumn. It usually germinates freely. Seedlings should be grown under glass overwinter, and planted out in late spring or early summer, after the last frosts. Semi-ripe cuttings, 7-10cm long, with a heel, may be taken in late summer, and placed in a shaded location. Layering may be performed in April, and typically takes 12 months to develop and adequate root system. There are a number of cultivars of Hoheria populnea available. ‘Alba Variegata‘: leaves have a broad creamy-white margin, often pink-tinged when young. A sport of 'Variegata' which occured in New Zealand prior to 1976. ‘Foliis Purpureis‘: leaves plum-purple beneath. ‘Moonlight‘: a white variegated variety. May be the same as 'Alba Variegata'. ‘Osbornei‘: a selection (1910) from Great Barrier Island, with leaves purple-tinged beneath. The flowers are distinguished by blue stamens. Described as a varietal form, rather than as a cultivar by Philips and Rix. ‘Purple Shadow‘: raised at County Park Nursery, in Essex, UK. ‘Purpurea': veins and under surface of leaves copper-coloured. ‘Sinclairii‘: more robust than the type, with larger leaves and flowers. Originally described as a species — Hoheria sinclairii Hook. f.
‘Sunshine‘: a yellow variegated variety. May be the same as 'Variegata'. ‘Variegata‘: an old cultivar (c 1926), the leaves are yellow-green, with deep green edges. There are also a number of cultivars of Hoheria sexstylosa available. 'Crataegifolia': a juvenile form maintained as a bush by vegetative propagation. 'Pendula': a form with a weeping habit. 'Snowflurry': A cultivar in commerce in the Pacific North West. 'Stardust': A compact columnar plant obtained from Hillier Gardens and named by Roy Lancaster. It flowers freely at an early age, producing dense clusters of star shaped white flowers during late summer. Leaves are mid green and very variable in shape, become narrow, richly green in colour, and neatly toothed as the plant matures. Performs best in a well-drained sunny spot, and may be hardier than the type. The side growth may be pruned to create an impressive summer flowering small tree. A floriferous slender tree, growing to 10m, from South Island and the southern half of North Island, with an easterly biased distribution. As a juvenile it is a shrub with densely interlacing (divaricating) branches. The leaves are serrated, with a pale undersurface. The adult leaves are lanceolate, 3cm × 1cm in size; the juvenile leaves are obovate, 8mm × 7mm. The flowers are white, ½" across, and shallowly cup-shaped. < pp class=text>'Borde Hill' is a cultivar of Hoheria angustifolia, also to be found named as 'Bordhill'. It bears masses of small, white, flowers in mid-summer. Young plants have small, dark green, slightly toothed leaves; adult leaves are longer and roundish, evergreen. Height 5 to 6 metres. Spread 1.5 to 3 metres. Synonyms: Hoheria microphylla and Hoheria populnea A. Cunn. var angustifolia Hook. f. are synonyms of Hoheria angustifolia. The mountain ribbonwoods, Hoheria glabrata and Hoheria lyallii, are found by forest margins and streamsides in the sub-alpine zone of the Southern Alps, at altitudes between 2000 and 3500 feet, often forming scrub like groves on the upper margins of the forests. H. glabrata, is to be found on the wetter, western, side of the mountain range, and H. lyallii on the drier, eastern, side. The former is also found on Stewart Island. 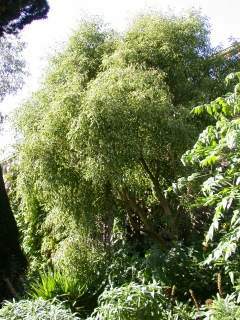 They are large shrubs or small trees, growing to 6m in height. The flowers of Hoheria lyalli have purple anthers and 10-15 styles. The anthers are set obliquely on the filaments. The fruit is a depressed sphere, breaking up into reniform carpels. The carpels are equal in number to the styles, and are downy and slightly winged. Those of Hoheria glabrata are scarcely or not at all winged. The foliage is deciduous. That of H. lyallii is cordate, deeply toothed, grey-green and downy on both sides. That of H. glabrata, and of juvenile specimens of H. lyallii, is smooth. In early summer the flexible branches are bent by masses of near-translucent, scented, white flowers. These flowers are up to 3.5cm across. Synonyms of Hoheria glabrata include Hoheria lyallii glabrata and Plagianthus ribifolia Allan. Synonyms of Hoheria lyallii include Gaya lyallii var. lyallii Baker f., Gaya lyallii var. ribifolia F.Muell., Gaya ribifolia Cockayne and Plagianthus lyallii Hook.f..
Synonyms: Gaya ribifolia Cockayne, Gaya lyallii var. ribifolia F. Muell., Hoheria lyallii glabrata and Hoheria ribifolia are synonyms of Hoheria glabrata. Gaya lyallii Baker f. and Plagianthus lyallii are synonyms of Hoheria lyallii. Hoheria 'Glory of Amlwch' is a semi-evergreen (retaining its foliage in mild winters) hybrid between Hoheria glabrata and Hoheria sexstylosa, originating from a garden in Amlwch on Anglesey (Wales). It has flowers up to 1½" across in late summer, present from an early age. A presumed selection of Hoheria glabrata is sold under the name 'Silver Stars'. lyalllii ‘Chalk Hills’: collected from the wild by Graham Hutchins of County Park Nursery, Essex, UK, and said to be hardier than the form generally in cultivation in the UK. lyalllii ‘Swale Stream’: collected from the wild by Graham Hutchins of County Park Nursery, Essex, UK, and said to be hardier than the form generally in cultivation in the UK. H. glabrata and H. lyallii are also in cultivation. They are hardier than H. sexstylosa (zone 8b) and are widely, if infrequently grown in the British Is. H. glabrata is possibly the hardier. They are also in cultivation in Europe, the Pacific North West and New Zealand. ‘Holbrook’: this was raised by Sampford Shrubs from seed from a plant misidentified as ‘Glory of Amlwch’. This is a late (August) flowering variety with a good scent. It may be assignable to Hoheria populnea. ‘Purple Delta’: a selection with a purple flush on the underside of the rather triangular, jaggedly-toothed leaves. Raised at County Park Nursery, in Essex, UK. All species of Hoheria, including Hoheria “Tararua“, have chromosome counts of 42. Ross's Black Scale, Lindingaspis rossi (Maskell) Ferris is recorded on Hoheria in New Zealand. W.J. Bean, Trees & Shrubs Hardy in the British Is. If you have found any errors on this page, or have any further information about the genus Hoheria then please contact me at webmaster@meden.demon.co.uk.